The Interiors 1900 Anderson Tiffany Ceiling Light Pendant has a beautiful art glass shade with ornate bronze effect metalwork. The Interiors 1900 Anderson Tiffany Inverted Ceiling Light Pendant has a beautiful art glass shade with ornate bronze effect metalwork. The Interiors 1900 Arbois Tiffany Ceiling Light Pendant depicts foliage, berries and clusters of grapes made from veined art glass beads. The Interiors 1900 Arbois Tiffany Semi-Flush Ceiling Light depicts foliage, berries and clusters of grapes made from veined art glass beads. The Interiors 1900 Ashtead Tiffany Ceiling Light Pendant has a floral border of autumnal colours. The Interiors 1900 Ashtead Tiffany Large Inverted Ceiling Light Pendant has a floral border of autumnal colours. The Interiors 1900 Bernwood Tiffany Flush Ceiling Light incorporates confetti art glass in earthy warm colours. The Interiors 1900 Bernwood Tiffany Inverted Ceiling Light Pendant incorporates confetti art glass in earthy warm colours. The Interiors 1900 Botanica Tiffany Flush Ceiling Light is in a simple yet elegant Tiffany design with a modern take on colour. The Interiors 1900 Brooklyn Tiffany inverted ceiling light pendant has bevelled and textured glass combined with rich cream art glass. The Interiors 1900 Brooklyn Tiffany semi-flush ceiling light has bevelled and textured glass combined with rich cream art glass. The Interiors 1900 Butterfly Large Inverted Tiffany Ceiling Light Pendant combines flowers and butterflies in colourful art glass. The Interiors 1900 Butterfly Large Tiffany Flush Ceiling Light combines flowers and butterflies in colourful art glass. The Interiors 1900 Butterfly Medium Inverted Tiffany Ceiling Light Pendant combines flowers and butterflies in colourful art glass. The Interiors 1900 Butterfly Medium Tiffany Flush Ceiling Light combines flowers and butterflies in colourful art glass. The Interiors 1900 Butterfly Small Tiffany Ceiling Light Pendant combines flowers and butterflies in colourful art glass. The Interiors 1900 Clematis Tiffany Ceiling Light Pendant depicts flowers weaving through trellis in shades of Pink and Purple art glass. The Interiors 1900 Clematis Tiffany Inverted Ceiling Light Pendant depicts flowers weaving through trellis in shades of Pink and Purple art glass. The Interiors 1900 Damselfly Tiffany Ceiling Light Pendant depicts a pretty damselfly fluttering around Mackintosh inspired roses. The Interiors 1900 Damselfly Tiffany Flush Ceiling Light depicts a pretty damselfly fluttering around Mackintosh inspired roses. The full range of Interiors 1900 Tiffany lights are available online at Luxury Lighting. 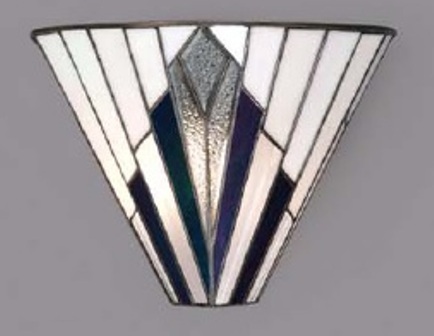 Interiors 1900 are held in high regard are well known for manufacturing quality Tiffany style lights which we supply at very competitive prices. The Interiors 1900 Tiffany lighting collection incorporates stunning Tiffany ceiling lights, Tiffany wall lights and Tiffany lamps.